On Sunday we drove out to Port Royal, Kentucky, a well-known little town because of one of its inhabitants, agrarian Wendell Berry. He’s oft-quoted here at Texas Schmexas, and a lot of other places these days, so I’m sure you recognize the name. I promise you, however, that Mr. Berry was not the reason for our drive (though I am pleased to have seen “the long-legged house” with my own eyes). Port Royal is in Henry County, a little over an hour from here with nary an interstate between us–lots of tobacco, though, hanging in old black barns decorated with colorful quilt squares (and “Mail Pouch Tobacco”) painted on the side, and fuzzy brown cows, and trees getting ready for winter, and a smattering of houses masquerading as towns. In fact, I only remember two or three little “towns” in that whole hour of driving, but one was called “Gratz,” reminding me of beloved central Pennsylvania and warming my heart. We wove our way around the country roads, carefully keeping track of road signs, when there were road signs to be kept track of. Port Royal, population of 79 in recent years according to Wikipedia, is home to two churches, a post office, a farm/feed/food store (which may or may not be a restaurant), and little else. We were in town for the Baptist church, where friends of our were preaching. We were greeted as we walked up the steps and were encouraged to join in teasing an older fellow as if we were old friends. He ended up sitting in front of us (or, I’m sure, we sat behind his regular pew and it was coincidental), and from him we learned the history of lots of folks around town–the young pregnant couple who ran an organic farm and farm stand, the former interim preacher who won the “outstanding Henry Countian” award, his grandsons who were in from Florida for hunting season… you name it, we heard it. Just before the “greet your neighbor” portion of the service, the gentleman at the pulpit announced that “we want to especially welcome our visitors here today,” and looked right at us. (I know we literally “stick out” in normal circumstances, due to our massive heights, but still, it made me chuckle to be called out from the pulpit.) This was a classic country church experience, though with a larger choir than expected, and I’m not sure what else to say. Glimpses into other people’s otherwise normal communities, especially churches, can do a lot of good for one’s soul–it can help you realize what you appreciate about your own community. Or, let’s rephrase that: it can help me realize what I appreciate about my own community. I don’t often appreciate it, truth be told, even as I sit in front of my computer on a (somewhat) regular basis and write about it. After church, we were welcomed into the home of a beautiful Henry County couple with an amazing view out over the trees. We ate lunch and we talked–about church, about people, about Henry County, our families, recipes, books, and, of course, Mr. Berry, who lived just over the hill and had known these folks since elementary school. We ate way too much casserole, stewed apples, bread, salad, broccoli, and oh-my-goodness pecan pie. And they tried to make us eat more. I wasn’t sure I could move. In fact, I wasn’t even hungry nine hours later as I was getting ready for bed (and not eating a bowl of cereal right before bed is not like me). It was a good day with good folks in a good place. Yes, you know it’s coming: it was community. I totally ripped this photo from a reviewer at urbanspoon.com. Fava’s is one of my favorite greasy spoons of all time, and it’s not just because of the food, though their frickles are quite amazing. Today I decided to forgo the frickles and ordered my standard small-joint fare (a reuben + cole slaw + a diet coke = happiness). I like Fava’s because every time I go there, I see people I know. For real. Today as we were sitting in our somewhat sticky little red booth, a guy from our church came in and sat at the booth next to us (both A and I are not so great with names, so I can’t tell you who he is, only that he sings in the choir). But every time I go there, I see people I know, usually people I know well. 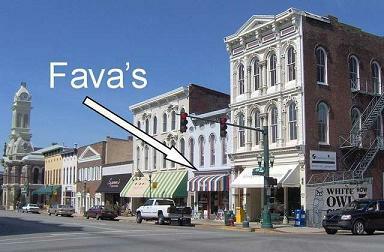 I like Fava’s because they’ve been in my little town since 1910! This year is their hundredth anniversary. That is quite a feat these days. I like Fava’s because there are chairs sitting out front on the sidewalk and no matter when you walk by during the day–early morning, lunch time, evening–there are always folks sitting out there and smoking. AND they say hi and ask you how you are. No matter what. I like Fava’s because the waitstaff ranges in age from 16 to 60, high-schoolers in low-rise jeans right up next to white-haired women with blue eye shadow. I like Fava’s because important people in the community dine there. For real. Today we saw a guy we both recognized from a billboard in town. Ha. Beat that. I like Fava’s because the decorations hanging on the walls and from the ceiling are absolutely random, mismatched, and kind of tacky. There’s a huge painting on the one wall that is a scene from Fava’s back in the day, complete with people who look like characters out of King of the Hill; there’s a big collection of Mickey Mouse paraphernalia near the door; two rows of mugs hanging the full length of the ceiling, side-to-side, I’d guess two hundred or so; signed stuff from the cast of The Nanny and Extreme Makeover: Home Edition from when Fava’s catered for them on location; and myriad other decorations. How can you not love this? And, as if those weren’t enough reasons to sing its praises, I like Fava’s because our waitress today knew what an Arnold Palmer was. My friend Patti took me out for my birthday last week and we went to our mutual favorite greasy spoon restaurant (of which Texas Schmexas has sung praises in the past–here and here). Patti’s pretty great. She recently became a proud grandma, in addition to being just a grand mama; she’s one of those really crafty people who can make a piece of paper turn into a work of art with a few folds and hand-press thingers; she’s one of my fellow odd ducks who meet monthly to share our writing; and she’s a lover of our local greasy spoon. She meets there regularly with friends. Weekly, I believe. She meets there often enough that the waitress who served us last week knew her.